I always panic at the beginning of a book because I look at it and think, There’s just no there here. (I also panic in the middle and at the end, but for different reasons.) It’s just a story about a Girl who isn’t even My Girl yet, and stuff happens but it’s just . . . stuff. There’s no depth, no layering, it’s all surface. Well, yeah, that’s because it’s the beginning. I know this but I still panic because I can’t imagine it will ever be more. And then I start to imagine, and more characters show up, and the story gets more complex, and the antagonist emerges as a character, probably still a caricature but with the potential to be fully rounded, and then I panic because the story is so much bigger than I thought. But one of the good things about “so much bigger” is that I have all this extra stuff to draw on for the opening rewrite. Characters are a lot more interesting because they’re so screwed in so many different ways in the plot. Most of the major characters are way over their baggage limit and paying the price. My protagonist gets more agency because she has to act since all these other people are running about screaming that the sky is falling. I’m spinning a lot more plates, but I’m not boring any more. Confusing yes, boring no. I think the increase is just due to worldbuilding, but that’s still a lot of characters with no end in sight. And then there’s PoV. I intended only two, Nita and Nick. But more and more I think Button needs a PoV, just so we have an outsider/human look at what’s happening. I’d say “normal human,” but it’s Button, so no. And originally I’d thought Button and Mort would Pair the Spares, but I’ve changed my mind on that. They just weren’t very interesting together, which was odd because they were interesting (to me) apart. But that’s okay because Max and Sequins have entered the fray. Yeah, that’s too much story. Fortunately, that’s an easy problem to fix. It’s always easier to cut than add. Swing wide in the first draft, cut later. That’s the ticket. Jenny, I saw the movie “Genius,” about Maxwell Perkins and Thomas Wolfe. Perkins talks about his fear of deforming the writer’s work. Could you comment on if you feel your work has been deformed? Also, no one would take “Look Homeward, Angel” in its initial form. Where’s the line on reworking/editing so that the work can reach readers? Thanks! “Deformed” is a big word. There have been a couple of times that editors suggested things and I went along and later thought, “Nope, better my way,” but no editor has ever said, “You have to do this.” And for the last twenty years I’ve been edited by Jennifer Enderlin who’s a goddess. Nobody would take Bet Me in its original form, either. That was because it sucked. I don’t think I kept 5000 words in the rewrite. If nobody will publish it, that means its not reaching its first readers, editors. If you feel really strongly that it should be published in its original form, there’s always self e-pubalishing. If the editors’ comments seem right to you, make the changes, otherwise no. LOL, looks like you have a whole new family, and I’m also pleased to see the dogs make an appearance (-:. Why are they Stripe and Pin instead of the other way around? They sound like a snazzy pair . . . .
Stripe comes first, but he’s very old and he doesn’t make it all the way through the book. Pin comes next, the runt of the litter, so “small stripe” = Pin. I just reread Strange Bedpersons and rediscovered another Nick. What works for me in that book is that Nick and Tess are both at fault — completely because their jerky behaviors rise from their personalities. Then they learn to be themselves while also being less jerky. Love it. In the beginning, it’s plot, but both their characters arc. A lot. Software question, and you probably already answered this 10 times: “What program lets you produce lists on graph paper, in beautiful columns?” asked the list-maker whose index cards are even quad ruled. It’s mind-mapping software but I use it for everything. It’s probably the program I use most after Cloud Magic, Safari, and Word. When I pair it with Acorn, I can do anything with it. My index cards are quad ruled, too, as is my note-taking paper. Quad rules. 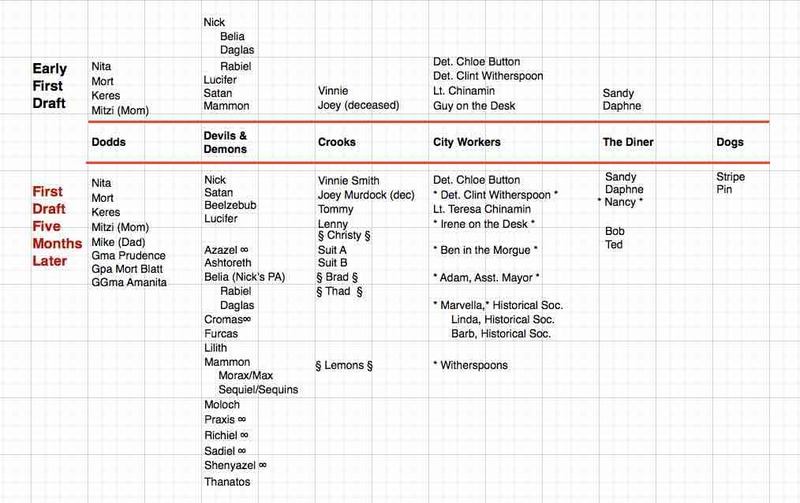 I think a few of your demons are repeated twice on the bottom, but it’s still a pretty impressive cast! I’m having the opposite problem with two WIPs– they’ve started out too big and need serious pruning. You’re farther along than you thought. Cutting’s easy, adding at a late stage is hard. Ahd I fixed the chart, too. Thank you. Looks awesome. Swing wide sounds like a great plan.